6 Pack. 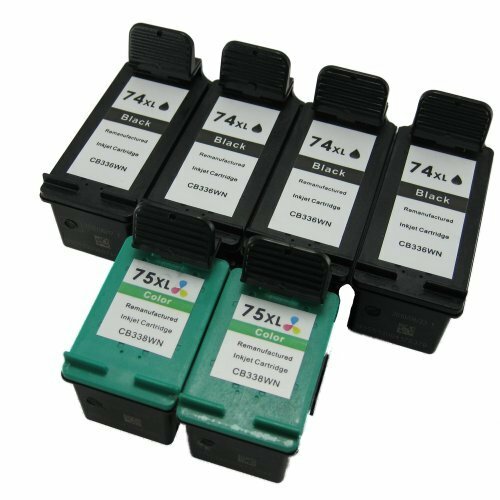 Refurbished Cartridges for HP 74XL and HP 75XL. Includes 4ea HP 74XL + 2ea HP 75XL. make sure that both of the contact points are clean and that the cartridge is installed firmly. The printer may need to be reset. To reset a printer they can follow these instructions. Remove the cartridges out of the printer and shut printer off.Unplug printer from the power outlet and your computer as well.Turn off your computer as well (if you are able to).Wait a few minutes before turning on your printer.Turn your computer on (if turned off).Plug in the printer to the outlet and to your computer as well.Turn your printer on and wait until it starts up.Install the printer cartridges, and if alignment page does not print out automatically, try doing it manually.The reset of the printer should allow the printer to read the new cartridge.